What happens if you take something that is ‘born digital’ – that is – something that has only existed digitally in its finished form, and attempt to print it? 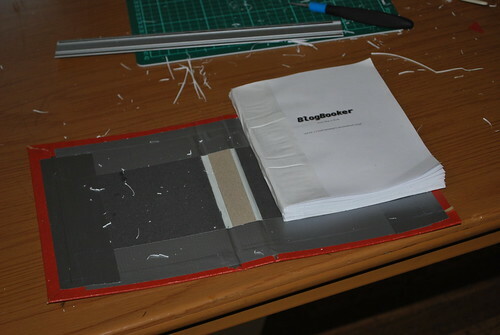 I decided to try to print my blog as an experiment to see what the issues might be, and aesthetically, what the finished book might be like as a book. I also wanted to get to the end result with as little manual digital work as possible; I wanted to see how close we can get to a 1-click print for something such as a blog. Obviously, if I wanted full control over the outcome, I could script it myself. I would also use a LaTeX workflow, as that seems to be the most straightforward way to create paginated content, programatically. Luckily for me, someone has already done much of the hard work: http://blogbooker.com/ – which is based on a LaTeX workflow itself. Given an XML dump from a typical blog host, the service returns a nice PDF, with a table of contents, inline images and all hyperlinks made as footnotes. It had a few issues but that may be caused by an export issue. Well, they are if you want to do anything with them, apart from print them verbatim. 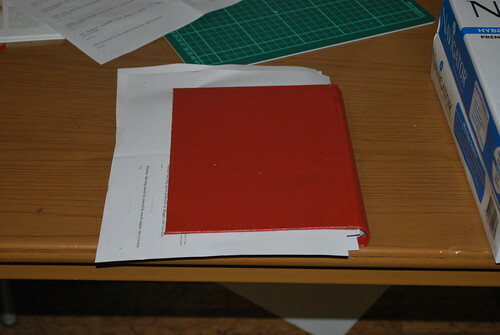 However, I needed to manipulate the page order as I wished to print the pages out into signatures. So, first step, create postscript from the pdf using a handy commandline tool pdf2ps. 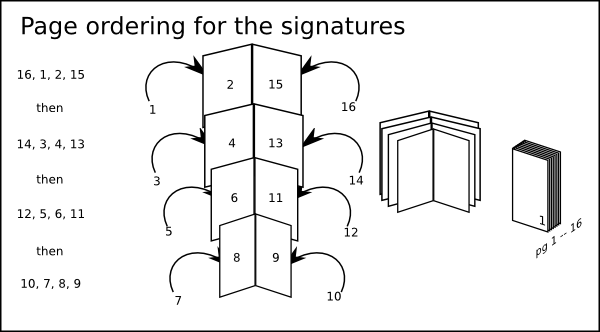 A signature is a term that loosely refers to a section of pages, folded together to be part of a book. 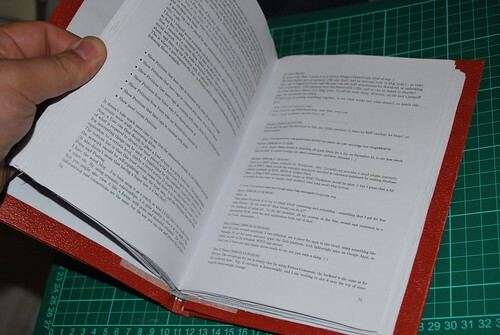 The section type used was a 16 page signature – in that there were 16 ‘pages’ of the book inside each section, which meant that each signature consisted of four A4 pages. 1 -> 16 goes to 16, 1, 2, 15, 14, 3, 4, 13, 12, 5, 6, 11, 10, 7, 8, 9. Urgh, mental gymnastics. Can’t someone else do it? 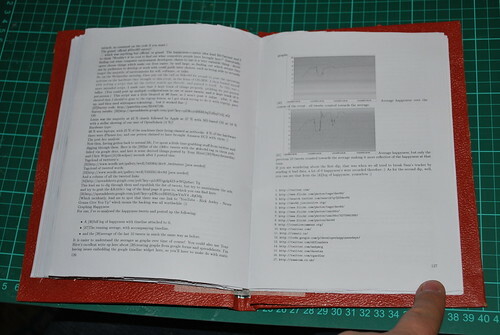 In this case, I used ‘psbook -w16 blog.ps blog.16sig.ps’ to create a 16 page signature version of the book. And then I hit print and had the usual fight with the the printer, involving shouting, cursing and physically rubbing the laptop against the printer, as it seemed to forget where it was on occasion. Once it finally printed, I folded out each signature with a bone smoother to get a sharp edge (cheap and very effective at what it does.) 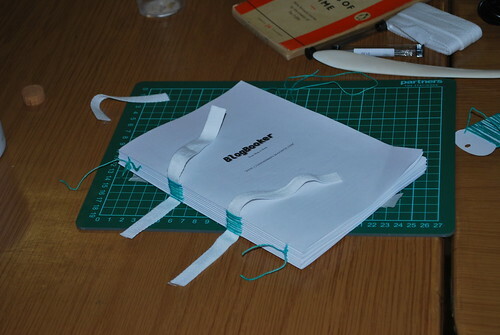 I ran a book awl down the stack of signatures, lightly marking the points where I was going to sew the signatures together. 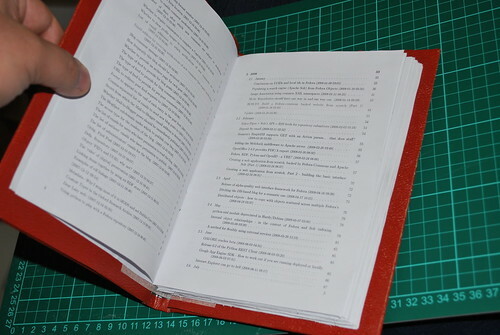 And here you can see the various stages of the book as I made it – please bear in mind I was very tired and under tight time pressure to get it finished so it’s quite scrappy. 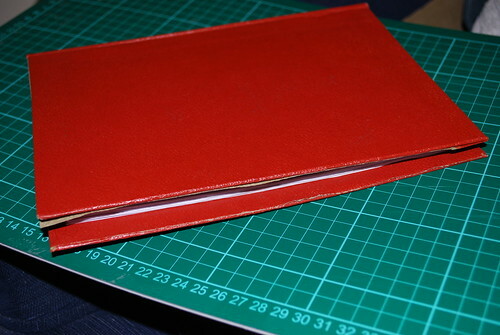 It’s also the first time I’ve made a hardback binding, and I completely missized the card! Just finished the sewing. The signatures are all bound together now. 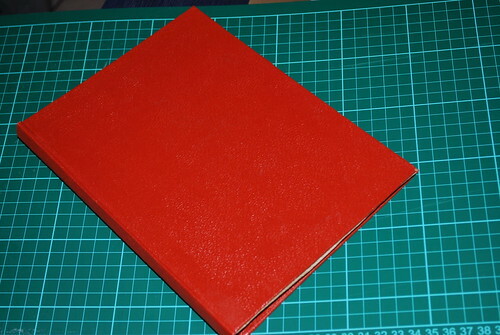 Gluing the cover sheets to the outer book case – equivalent to step 10 in the linked to binding guide. Update – one thing that I didn’t get a chance to experiment with here was how to include richer media, such as video. The way I had intended to tackle this was to include snapshot of the video on the left, with the video’s metadata pulled from Youtube/Vimeo on the right. To the right of this would’ve been a QR code, so that it would be easy to augment reading the article, with watching the video on a mobile device. ← Giving the MPs a receipt for their expenses claim. In Soviet Union it was called “Samizdat” (Самиздат) it means “I publish by myself”.